This asana is one among the baby backbends. This pose seems simple, but is challenging. This is an asana you must include in your workout regimen. Lie on your abdomen on the ground and place your hands by your side. As you inhale, lift your legs and upper torso. Using your inner thighs, lift your leg upwards without bending your knees. Your weight should rest on your lower ribs and abdomen. Hold the pose for a minute. Release. If you are experiencing a headache or a migraine, or suffering from a neck or spinal injury, avoid this exercise. Pregnant women also must avoid this asana at all costs. In case you have a neck injury, you must ensure you look down at the floor and keep your head in a neutral position. You could also support your head on a folded blanket. Beginners can start by just lifting their legs, keeping their upper body on the ground. You may also use your hands for additional support. To increase your stretch while you are in this asana, you must gently bend your knees, instead of stretching out your legs, such that your calf muscles are perpendicular to the ground. Once your legs are in position, lift your upper body – the torso, the arms, and the head – and lift your knees as high as you comfortably can. Then, as you lift the upper torso, head, and arms, lift the knees as far away from the floor as possible. 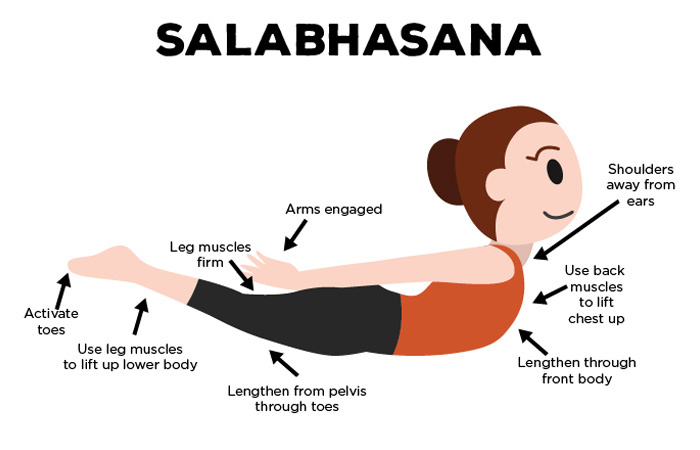 These are a few amazing Salabhasana benefits. This pose invigorates the entire body, stimulates the internal organs, as well as enhances the circulation of blood. This asana helps to regulate the acid-base balance in the body. The arms, thighs, shoulders, legs, calf muscles, and hips are strengthened through this asana. The back is also toned and strengthened. 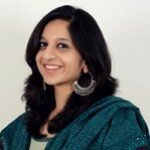 This asana also encourages a healthy posture. It regulates metabolism and helps you lose weight. It also helps reduce stress and tension. The Salabhasana is said to resemble a locust at rest, but this pose is anything but a resting pose. It takes a whole lot of effort to just get into the pose, just as the grasshopper makes that jump to throw itself backward. When you practice this asana, just getting into the pose and staying there is intense. It teaches you how to focus and put your mind to work. You remain calm, yet alert. This asana also works as a blueprint backbend, which allows you to understand the right alignment for other backbends like the Dhanurasana, the Urdhva Mukha Svanasana, and the Chakrasana. This pose strengthens your abdomen and back. Your chest opens up as well. Your body becomes more aware of itself, and as you practice this asana, you begin to understand what is required for a balanced backbend. Your body is strengthened enough to help you with arm balancing poses, inversions, and asanas that require the engagement of the abdomen. Usually, backbends use the limbs to push the body against gravity. But in the Salabhasana, the hands and the legs are suspended, and therefore, your back and abdomen need to work harder to lift your body. About 20 seconds into the pose, you will notice the effort that goes into holding the pose. The key is to remain in this pose as long as you are rejuvenated and aware of your body and surroundings. Ardha Chandrasana / Half Moon Pose – How To Do And What Are Its Benefits? Vriksasana / The Tree Pose – How To Do And What Are Its Benefits? Paschimottanasana / Seated Forward Bend Pose – How To Do And What Are Its Benefits? Padangusthasana / Big Toe Pose – How To Do And What Are Its Benefits?